Any updates will be posted in this thread. Registration opens at 10:00 AM and closes at 11:30am, driver's meeting at noon and racing beginning at 12:30 PM. Race fee is $25. You must also be a member of the Thunder Bay Autosport Club to be covered under insurance. An annual club membership is $50 which will entitle you to participate in all of the 2015 Autoslaloms or you can opt for a $20 day-membership. Spectating is free! This year, the Autoslalom Fundraiser will be held on Sunday, August 23, 2015 at Lot 'I' of the TBRHSC. Race fee is $50 or only $20 if you raise over $100 in pledges. Pledge sheets are available, if anyone is interested in collecting donations please let me know and I will drop off some pledge sheets. Cant Wait! gonna be a good year! With these bigger lots will you guys be utilizing a roll through finish? This is great. This definitely gives better options for fellas who do shift work! We definitely can with some lots. I'll pass this along to Shawn and Cam. Miint! But damn, the June 20th one is the MAP weekend! Civic will be out on the 8th to do some fwd burnouts! We are waiting on confirmation from Intercity and Test & Tune so some locations may change but the dates are pretty solid. Any updates will be posted in this thread. Registration opens at 10:00 AM, driver's meeting at noon and racing beginning at 12:30 PM. Race fee is $20. You must also be a member of the Thunder Bay Autosport Club to be covered under insurance. An annual club membership is $50 which will entitle you to participate in all of the 2015 Autoslaloms or you can opt for a $20 day-membership. Spectating is free! 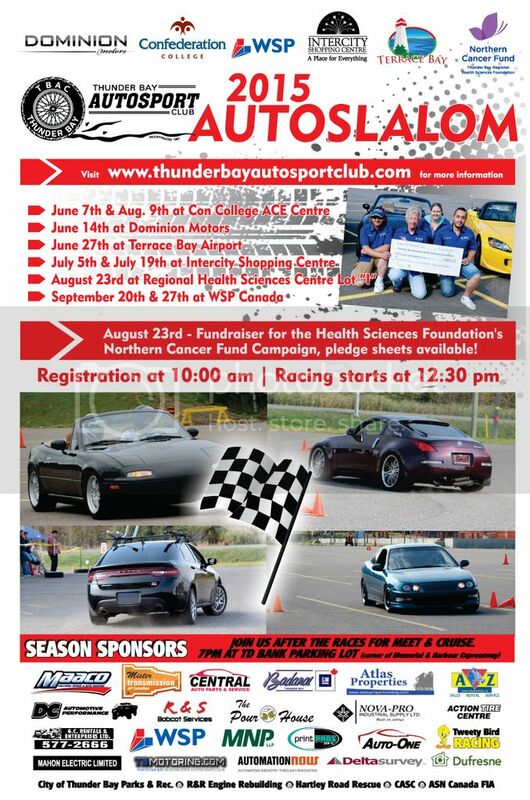 This year, the Autoslalom Fundraiser will be held on Sunday, August 23, 2015 at Lot 'I' of the TBRHSC. Race fee is $30 or only $20 if you raise over $100 in pledges. Pledge sheets are available, if anyone is interested in collecting donations please let me know and I will drop off some pledge sheets. meets at 7:00 on these days? This day wasn't part of the original schedule. It wasn't on the schedule. We added Test & Tune at the last meeting, which was supposed to be our first day at the ACE lot, it seems they added this extra day in so we didn't loose a local day. Good catch you two, I'll remove it.